Between the craziness of the holidays and helping to care for a very sick (and much loved) relative, I have been looking for ways to find some solace from the disquiet and unpredictability of current life. The serenity of the morning is where I have been finding the most peace lately. After I drop off the kids at school and my husband has left for work and I have the house to myself, I brew a cup of tea with mindfulness and purpose. There is something about the ritual of making a proper cup of tea that I find very therapeutic. Whether it’s watching the steam rise from the cup or watching the milk swirl into the tea as I stir, there is an hypnotic quality to the process. And with tea comes scones. Cream scones are the classic choice but I also love these dried cranberry scones. 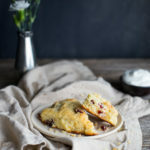 They are just as light and tender as my favorite cream scones but have an extra pop of flavor from the dried cranberries and freshly grated orange zest. The cranberry and orange pairing also make these scones great for the winter and holiday seasons. I should warn you that the dough for these cranberry scones is very sticky. This isn’t the type of dough you can roll out and then cut cleanly with a biscuit cutter. Instead the dough is spread out on some parchment paper and then scored with a bench scraper or large knife. Once the scones are baked you can neatly pull the scones apart along the scored lines. Using some nonstick cooking spray to coat the offset spatula for spreading the dough and the knife for scoring the dough will help tremendously. Although the dough may be a little hard to work with, I guarantee you will have no problems finding help to eat these cranberry scones. Preheat oven to 400 degrees. Line baking sheet with parchment paper. In the bowl of a food processor, mix flour, sugar, baking powder, and salt together. Add butter; pulse until mixture resembles coarse crumbs. Add cranberries and pulse again 2-3 times to mix in. Set aside. Whisk buttermilk, egg, vanilla, and orange zest together in a small bowl. Pour flour mixture into a medium bowl and then add the egg mixture to the flour mixture. Stir together with a wooden spoon or rubber spatula just until dough forms. Let the dough sit at room temperature for 5 minutes (this will allow the flour to better absorb the liquid so the dough will be easier to work with). Scrape the dough on to prepared baking sheet. Using a rubber spatula, shape the dough into a 6-inch round. Spray a small offset spatula with nonstick cooking spray and use it to gently smooth out the top of the round. Spray a bench scraper or large knife with nonstick cooking spray. Cut the round into 8 wedges, respraying the scraper or knife as necessary if dough sticks. Sprinkle an even layer of sugar over the scones. Bake scones until golden, about 15 minutes. Dried cherries can be substituted for the dried cranberries. Recipe adapted from Bon Appétit, Oct 2005.